The morning dawned clear and chilly with a light southwestern wind. I had worked the graveyard shift at the Borger Refinery & NGL Center (Phillips 66) and had gotten off of work at 5:30 in the morning. After having invited several friends to go fishing with me and listening to them tell me how crazy I was for going out in 35 degree weather, I finally had a taker. Now whether he was crazy too, or just loved fishing as much as I do, I don’t know, but we headed out with a sense of something to come, good or bad , I just knew something was bound to happen cause it was Friday the 13th of March. Lake Meredith is located about 45 miles Northwest of Amarillo, Texas. It is a 16,550 acre lake with lots of rocky shorelines and deep dropoffs, (ideal for smallmouth) but not hardly any trees around it at all, so if ya’ll come for a visit, bring plenty of sunscreen. About 2 years ago they flooded the lake and put a lot of brush and small trees under water, so now it is coming on strong as a bass lake. Now I don’t claim to be the best fisherman on this lake, but I do know how to fish this lake. I had caught most of my smallies on Crankbaits and Jigs until I started experimenting with a FleFly slab and curly tail grub combination. The smallmouths seem to attack that thing like it is their worst enemy. As I have said before, I had caught some nice fish in this area before, in the range of 3 to 5 pounds. I had a 3/4 ounce slab with a glow in the dark curly tail grub on it, and Tracy was fishing with a Little George. We were drift fishing in about 35 feet of water and bouncing them off bottom and pulling it up about 8 feet and then letting it flutter back down. On the first pass, something big hit that slab, but I missed it, so we circled back around and drifted across again. This time I was ready when it hit. I could tell that it was big by the pull of the rod. I pulled it up about halfway when it started its run out away from the boat. It surfaced about 35 feet out and we could see that it was a nice one. It decided it liked the deep water better and headed back down, I just let it go and then started reeling it back up when I felt it tire. This time it surfaced about 10 feet out, I looked at Tracy and his eyes were as big as saucers, as were mine. It made 1 more run to bottom and then gave up, and when we hauled it into the boat, we both knew that I had a lake record. There sure was a lot of whoopin and hollerin that went on in that boat. I would like to take just a minute and talk about THE DREAM. You know the one I’m talking about. The one that every fisherman, be it man or woman and especially children, has when they are out fishing. The dream of catching a record size fish and having your name in the record books. I have had that dream since the age of 7, when I saw my dad reel in what I thought was a monster fish. Most people like to fish just for the thrill of the fight, but in the back of their mind, there is always the DREAM. On March 13th 1998, I realized that dream. After taking the fish in and getting it weighed and certified for a lake record, it was then that I found out that I not only had a lake record but a state record. My fish weighed in at 7.93 lbs., was 23 inches long and had a girth of 19 inches. It was official, I now owned the Texas State Record for Smallmouth Bass. I named the fish Jason, because it was caught on Friday the 13th. I donated Jason to the Budweiser Share a Lunker program, and she is now residing in the Texas Freshwater Hatchery in Athens, Texas…located 75 miles Southeast of Dallas, Texas. Because of Jason, I have had the opportunity to meet and talk to a lot of people that I would never have gotten to, if not for the record. So far it has been a very enjoyable experience, one that I would not trade for the world. If you come to Lake Meredith, be sure to stop by Larry’s Marine and bait store and pick up some of the FleFly slabs. The phone number is (806) 857-3464. If you ever get down this way and need some information on our lake, you can give me a call at (806) 857-2445, or just call and shoot the breeze. I don’t claim to be a great fisherman, but I am a sincere one, and I will share my knowledge of the sport with you. So long and good luck. P.S. There have been some magazine articles that refer to my catch as an “accident”. It seems that since I mentioned that we went out that morning in search of some of the pre-spawn walleye that Lake Meredith is famous for (The Texas State Record for Walleye also comes from here) they took that to mean that walleye is what I was fishing for. I would like to set the record straight. I am a BASS fisherman at heart, and I work hard at bass fishing, but I do love to eat Walleye, although I do not claim to be a seasoned veteran at walleye fishing. My buddy and I had set out to catch some of the walleye to take to work and have a fishfry with our co-workers. After fishing for 30 to 45 minutes with no luck. I asked my buddy Tracy if he would like to switch to Smallies. I told him that I had been having really good luck with the smallies in the cold weather. He said “Sure, I’m just here to catch fish, no matter what kind.” So we switched out lures and headed to one of my honeyholes. So no matter what you may read elsewhere, at the time that I caught Jason, I was BASS fishing. That’s my version of the story and I am sticking to it. Thanks for taking the time to read my story and I hope that you enjoyed it. Early Spring starts as early as late January in the deep South to right after ice out up (April or even May) in the North East. Early Spring temperatures should generally defined as from 32 degrees to 50 degrees. Even before the ice clears away from the launching ramp, brave souls have broken through the ice to launch their boat to get to the ice free areas. 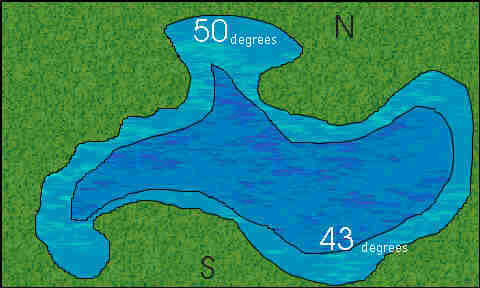 In those areas that are ice free the water temperature is usually in the upper 30’s to low 40’s. While to most people that seems way to cold to start fishing you have to remember that the bass have been inactive and mostly in the dark for 3 or 4 months and with the ice gone and the sun warming the water to around 40 degrees that’s about an 8 degree jump in a relatively short period of time. The bass are going to move up into the shallows where the water is warmer and to look for whatever forage fish(perch, sunfish, minnows, etc.) have started moving around. The best areas to find would be shallow water flats or ledges next to deep water. Such as coves on the Northern side of the lake. The reason that they warm up faster is that as the days get progressively longer and the sun moves higher in the sky the Northern areas receive more sun and therefore warm up faster. Also during the early Spring any cold fronts that move through generally bring winds out of a Northerly direction and the Northern sections of the lake would generally be protected from the wind. Some good choices of lures would be to use natural colored crankbaits, spinnerbaits, suspending jerk baits or jigs. The best colors would be perch, shad, crawfish for crank baits. For spinnerbaits the best colors would be alewife, chartreuse, white, blue, or any combination of those colors. Jig colors generally would be black, black/blue, blue, crawfish and would be fished with a trailer either pork or plastic. Although this time of year a pork trailer would be better since it would be more flexible in the colder water. This time of year if you start early in the morning it would be best to start off with a slow retrieve at first. Increasing and varying your retrieve and speed as the water warms up. Remember even though the water is still cold, as it gets warmer throughout the day it is still an increase in temperature and the bass will become more active! At first start in no more than in 10 feet of water and work your way shallower. Don’t be afraid to throw your lure shallow even if you think that the water is too cold for them to be that shallow, you just might be surprised! Types of retrieves should range from an extremely slow crawl along the bottom with either a jig or crankbait or slowrolling a spinnerbait to “burning” a crankbait as fast as you can.You should also use as light a line as possible. This is for several reasons, the most important one being that it gives your lure more action and allows it to act more natural. Of course it all depends on the type of cover you are fishing, use your best judgement and common sense. If you are using crankbaits particularly balsa wood like the Rapala’s replace the treble hooks with a set that are 1 size larger than what’s on there. Use a stop and go retrieve, the bait will generally suspend or will rise extremely slow when you stop the lure. This is an excellent technique to use if the water is still cold and the bass are being a little finicky. When you stop the lure watch your line because you generally will not feel them hit. All you will see is a twitch in the line. That’s right! A spinnerbait that is made out of Titanium. You may be wondering why on earth would somebody want to make a spinnerbait out of that. Isn’t that what they make space ships and stuff out of?? That’s exactly the reason the the makers of the Terminator decided to use Titanium. It’s extremely strong, flexible and has an excellent “memory”. The term “memory” here refers to the metals ability to bounce back to it’s original shape. So a perfectly tuned Terminator Spinnerbait will always run straight no mater what you or the fish will do to it. All reports indicate that the claims that they make as far as the bait running true out of the container are accurate. The only current drawback to this bait would be the price. It’s about double the price of your average spinnerbait. However if you have to keep replacing your spinnerbaits every so often because you, the fish or the places you fish just absolutely destroy them then the investment should be worthwhile. You use these baits like any other spinnerbait (only with these you can throw them anywhere and they won’t get damaged). A typical retrieve for this time of year could be just a simple straight cast and retrieve, or something as complicated as a slow-roll just above some submerged weeds. Other techniques include “burning them” just under the surface so that they make a wake, combine this with an occasional stopping the retrieve so the lure “helicopters” down( giving the look of a dying shad or minnow) and the bass will just nail the living daylights out of it. Although this lure has been around for a year or two this is one that should definitely be added to your tackle box and this time of year in the North and Northeast have one tied on at all times. This lure comes in four sizes, from 3 1/8″ long (1/4 oz) to 5 1/2″ long (1/2oz). The most productive for Smallmouth’s being the 3 1/8″ and 4″ sizes. This is a thin narrow bait designed with no real built in action besides the standard wobble you get with a steady retrieve. The action depends entirely on the fishermen/fisherpersons using it. You have to give the bass the impression that this is a wounded baitfish. The most attractive feature about this and most other good jerkbaits is that it suspends when at rest. Meaning that when the lure is at rest it just sits there, neither rising or falling (just like a real baitfish) this bait also has built in rattles to help bass locate it. Obviously you can use as heavy a line as you want but for clear water you want to use as light a line as you can. So far 8lb test is the lightest that’s been used here but you can probably go with 6lbs test if your very careful with your method of retrieve. Speaking of retrieving… the way to retrieve a Husky Jerk is after you cast it out give it a twitch or “jerk” then pause then twitch. You can vary this by giving your bait several twitches in a row before pausing or combining a swimming retrieve with twitching. How hard you twitch or jerk this bait depends on the strength of the line and the action of the rod you are using. When the water is still cold or when the fish are being finicky a lot of your hits will be when the lure is “suspending” or sitting still. You won’t know you have a bass on until you try to twitch it again. If they are aggressive they will try to take your arm off when they strike. This is a relatively new bait from Florida (of all places!). It was originally made for Largemouth bass but it is also an excellent choice for Smallmouth. The lure is made out of solid wood and will cast like you wouldn’t believe! Due to its shape it is ideally made to order for “walking the dog”. A good technique to use in addition to “walking the dog” is to combine the topwater retrieve with that of a crankbait retrieve. Cast past the spot you want to target and crank it close to where you want to go then stop the retrieve and let it rest for a few seconds or longer then start your topwater retrieve. Although it doesn’t have a bill it will dive down to about two feet and it does have a little action when it moves through the water. It comes in a variety of colors and two sizes, 3 1/4″ and 4 1/4″. The 3 1/4″ size is a good size to use for most Smallie use. This is perhaps one of the best Smallmouth lures ever invented! Every serious Smallie fisherperson should carry one in their tackle box whether you’re in a boat on one of the big Southern impoundment’s or floating down the New River in Virginia. The lure comes in various sizes and colors, one of the best colors being the Gold/Black back. Sizes range from two inches to a huge seven inches! The most popular method of retrieval is to throw it out next to your favorite piece of cover or over a shallow rocky flat and just let it sit there until the ripples fade away then twitch it. Wait until the ripples fade away again and twitch it again. Keep doing this until a Smallie nails it or it gets to your boat. You can also use it as a “jerkbait ” by giving it a good hard twitch or jerk which will pull the lure down about 12 to 18 inches. The bass will usually hit it when it’s under the surface usually just as it starts to rise. You should always use as light a line as you possible can to give the lure a more natural presentation. This lure also has some built in action and can be used as a crankbait. It will dive to about two feet and has a natural wobbly type action. A lot of hits will come as an angler is retrieving the Rapala back to the boat (not paying attention of course) and the bass will hit and usually get off. This lure really needs no introduction since it set a new standard in the lure industry when it was first introduced. For those of you who are not familiar with it, the Shad Rap most closely imitates the natural action of a shad, minnow or other small baitfish. Plus the profile of the lure also looks completely natural. The most popular size is the #7 which is 2-3/4″ long, the smallest size is 2″ and the largest is 3-1/2″ long. It comes in 8 different colors and at least one of them should match the baitfish in your area. The most productive colors are the Shad and Perch colors (since these represent the most prevalent type of baitfish available). These lures can be used in any body of water from small streams to large reservoirs. You can just cast into the current of a stream or river and retrieve the lure with the current around rocks and logs or use a stop and go retrieve over submerged weed beds in your favorite lake or pond. One way to make your Shad Raps more effective is to change the hooks to one size larger. This will cause them to suspend or rise slowly when the lure is stopped. Using a stop and go retrieve with larger hooks is an especially deadly method when the water is cold and the Smallies are a bit sluggish. These lures are made by Neal’s Handcrafted Lures out of Virginia. The quality and craftsmanship of these lures is excellent. The lures pictured above are 1/8 oz. hair jigs, a 1/8 oz. spinner bait and two 1/4 oz. spinnerbaits. In field testing I removed the weed guard from the black/brown jig as there were no weeds in the area and prefer not to have them on my jigs. In testing them on a spinning rod with 8 lb. test the jigs cast well, the paint isn’t susceptible to immediate chipping when worked over rocks and catch Smallies as well. The best retrieve for this time of year (water temperature was 46 degrees) was to work the jig in 9 – 11 feet of water (this was at the edge of a drop off) and after the jig hit the bottom pop the jig up about two feet and let it slowly descend. The bass would hit the jig as it was falling. Another method that is good is to swim the jig along the bottom. Keep the jig about a foot or two above the bottom or at least just touching the bottom and slowly and steadily retrieve the jig back to you. The spinnerbaits performed excellently as well. The baits ran true without any pre fishing adjustments and the skirts pulsated freely behind the blades without getting tangled. These can be fished like any standard spinner bait but with the color combination of the 1/8 oz. pictured above you may want to work them in the same manner as I described the jigs. The results may just save the day. Phil’s World Class Hair Jigs! Phil’s World Class Hair Jigs are definitely the cream of the crop when it comes to not just hair jigs but all jigs. The workmanship, detail and just plain hard work that goes into them makes them perhaps the best hair jigs in the country. The action that these jigs have give it a very life like presentation when used in a variety of retrieves. The most popular method of retrieve for these jigs is a swimming retrieve. After you cast out your jig you let sink down to the appropriate depth and reel the jig in similar to a crankbait only a lot slower. Just enough speed to keep it off the bottom. While retrieving you can also sweep the rod tip up or shake it a little to give it more action. Another method is the stop and go method while dragging it along the bottom. Slowly drag the jig across the bottom pausing occasionally for a few seconds then continuing. This works better if the bottom is fairly smooth or on small gravel. If you try this with a lot of snags and a very irregular bottom you should carry a good supply with you. The retrieve that has worked the best recently has been hopping it along the bottom. In this situation the bottom was broken up with all sizes of rocks from small gravel to car size boulders. After your jig hits the bottom jerk your rod tip up so that your jig hops up about a foot or two and keep tension on the line. This will cause the jig to fall towards you and when they hit you will usually be able to either see your line move or feel them hit depending on how aggressive they are. Phil’s jigs come in 1/8, 1/4 and 3/8 oz. sizes. The “Bou-Tube” combines a tube with a marabou tail and the results are fantastic! Already well renowned for their jigs by In-Fisherman Magazine they have broken new ground with this innovative design. As for their action, imagine the flowing and flaring tail of the marabou jig and combining that with the versatility of a tube jig. The result is a much more lifelike action than that of just plain plastic tentacles. You can hop them like a tube bait or use a combination of swim/jerk for a unique erratic retrieve, similar to a jerk bait. With the head of the jig being somewhat protected by the tube it’s not as susceptible to hang ups as regular jigs are. ” I often fish it glided just over the bottom in spring as you would use a hair jig. In Spring and early Summer, look for Bass in “staging areas”, or areas where they are likely to hold for a while before moving to their bedding locations. These “staging areas” are often secondary points in bays, creeks,or ditches and depressions on flats. Finding Bass is the key to catching Bass! Always use a systematic approach. I like to use plugs such as a Crankbait, Jerkbait, Spinnerbait, or Topwater. These lures cover a lot of water in a short time, and find the fish for me. When you find one or two Bass in a likely spot with these lures, don’t move on. It’s time to break out another bait. Quite often I change to a Worm, Lizard, or Jig, and take several more bass on the same spot. 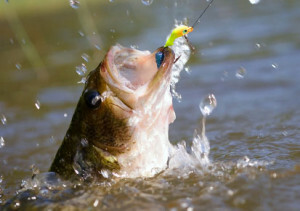 Successful Bass fisherman are alert to water and weather conditions because they are a primary influence on Bass. It is important to understand these factors, and make wise decisions to determine likely location, patterns, and fish depth. I’ll talk more about that in the near future. This rig works equally well in Spring, Summer, or Fall. Successful fishing for Bass requires the proper tackle. The rod is the most important part. I use a 7 foot long Falcon Rod called a Carolina Lizard Dragger model #LFC617 paired with a Shakespeare Medalist Reel model #460UBC spooled with 20 pound test Super Silver Thread Line.The long rod is important for a long cast, and lets you get the proper “hook set” with a long sweeping motion. The hook set is the most difficult to learn. Remember, when a Bass bites, you must get the slack out, get the weight off the bottom, and hook the Bass all with one sweeping motion of your Falcon Rod. Use a short leader 18″to 24″ in shallow, stained water and a long leader 4′ to 6′ in clear and deep water. My favorite soft plastic lures are 6″ Riverside Lizard in Green Pumpkin or Watermelon Seed colors. Most fishermen fish the Carolina Rig too fast. Make short pulls along the bottom moving the weight 6 inches to 1 foot at a time. Wait a few seconds between pulls. When the Bass strikes, take your time. Count to 3 while reeling up any slack line, and then set the hook! When fishing for spawning Bass in clear water, wear a gray or green shirt, and try to keep a low profile in the boat. Don’t make any sudden movements when approaching a likely spot, and try to be as quiet as possible. Loud talking and loud noises coming from your boat are sure to hurt your chances. Spawning bass are very vulnerable: So, to guarantee a successful spawn, always carefully release any Bass that you might catch. Often male or “Buck” Bass will stay on the spawning beds after the “Sow” or female BASS has deposited her eggs. The male will fertilize the eggs, and remain in the immediate area “guarding” the nest. He will usually stay around for some time as he will often guard the small “fry” after hatch. This is the time to catch these big bucks by finding the beds by sight and carefully looking for these prized Bass. In Summer, the warmer the water, the larger the lure you can use. In 60-65 degree water a 6″ Lizard or Worm is about right, but at 70 degrees I’ll often use a 6″ to 8″ Worm. At 75-80 degrees, I’ll choose a 10″ Worm. My favorite “Big Worm” is a 10″ Riverside Ribbontail in camouflage or black. To create good summer fishing try planting brush piles in your favorite lake. Be sure to check your state and local laws first. Put your brush piles or “fish shelters” on points, humps, or ledges in 10′ to 20′ of water depending on water clarity and thermocline. The clearer the water, the deeper the Bass will be found, and remember, thermoclines on reservoirs gradually get deeper and deeper as the summer progresses. On many lakes Bass become nocturnal feeders and are actively feeding at night. I heartily recommend night fishing. It’s often cooler and more relaxing when the weather gets really hot. Use 8″ to 10″ Riverside Worms in black, plum, and camouflage colors. Also, you might want to try a Spinner Bait. I prefer an Excalibur “Nite Roller” in black with a pork chunk trailer. Fish around brush, weeds, or any structure that you can find. Remember, stay close to deep water. 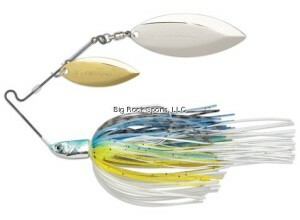 The Zara Spook and Spit”n” Image are great lures for fall Bass. “Walk the Dog” action can call Bass over great distances. try the main lake points and humps first. Fish the lures over 10′ to 25″ of water. You’ll get best results early in the morning and late in the evening on those cloudy, fall days. Shad or Bait Fish are the key to finding fall Bass. First locate the Shad or other Bait Fish and determine their holding depth. Then fish your live bait at the the same depth as the bait fish. This is my formula for fall fishing. Look for the Bass with crank baits along points and creek channel ledges.